The top US envoy for North Korea on Monday expressed confidence about achieving North Korea's nuclear disarmament, despite worries about the slow pace of nuclear diplomacy in recent weeks. 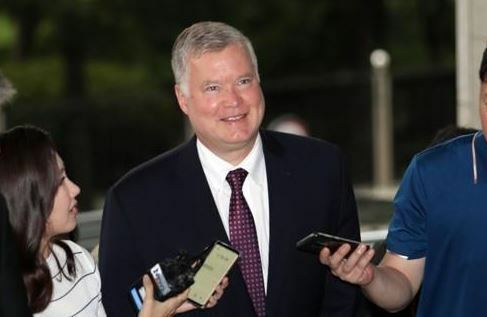 Meeting with his South Korean counterpart in Seoul, Stephen Biegun said that Washington and Seoul have a shared goal of ending seven decades of hostility on the Korean Peninsula. "The primary requirement for us to get to that endpoint is to achieve the final, fully verified denuclearization of North Korea," Biegun said. "So I am absolutely confident that this is within the reach, and I think our two presidents are singularly focused on this goal." South Korea's chief nuclear envoy Lee Do-hoon said that "denuclearization process is at a critical juncture and we need to meet up as often as possible." Since entering nuclear talks earlier this year, North Korea has taken some measures like halting nuclear and missile tests and dismantling his nuclear testing sites. The United States suspended some its annual military drills with South Korea, but is reluctant to provide the North with big political or economic benefits unless it takes more serious disarmament steps. The North's closure of its nuclear testing site was watched by foreign journalists, not examined by experts. Earlier this month, US Secretary of State Mike Pompeo made his fourth visit to North Korea, and he was coordinating with allies Japan and South Korea to arrange a second summit between President Donald Trump and Kim. The moves brightened prospect for related high-profile US-North Korean exchanges, but no major breakthrough has since been reported.